A lifelong educator, Mrs. Lucille W. Knox went home peacefully on the morning of October 28, 2018. Mrs. Knox was a beloved wife, daughter, sister, and aunt. Affectionately known as “Honey”, Mrs. Knox dedicated her life to educating several generations of students. Mrs. Knox received a B.A. degree from Miles College followed by a Master’s degree in Education at Northwestern University in Chicago. Mrs. Knox taught school in the Birmingham metropolitan area for over 40 years, including teaching at Lawson State Community College. She remained at Lawson State until 1982, when she retired as Chairperson of the Department of English. She was loved and respected by her students, family, and neighbors. Mrs. Knox was a very caring and loving individual that displayed a combination of strength, determination, pride, and faith throughout her life. She resided at her residence on Maple Avenue for over 50 years, and lived there independently for over 20 years until less than 2 months prior to her passing. 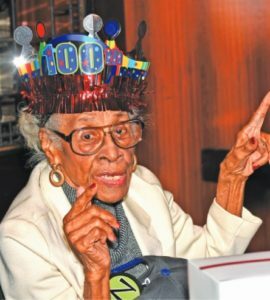 She was recently recognized during her 100th birthday celebration with Resolutions from the City of Birmingham, Jefferson County, and Lawson State University. Mrs. Knox was preceded in death by her husband Dr. Thomas J. Knox, her stepson, Reginald Knox, and her four siblings: Ethel W. Prince (James), Valeria W. Gillespie (Harold), Sarah W. Hayden (Robert) and, Walter Washington, M.D (Ruth); and, her parents, Aaron and Louvenia Moss Washington. She was also preceded in death by three nephews – Harold Gillespie Jr., Scotty Wren, and Walter M. Washington. Mrs. Knox is survived by 4 nephews – James W. Prince, Charles R. Prince, M.D. (Kapauner), Eric D. Washington, M.D. (Joyce), and Kevin E. Washington (Lois), and one niece, Vicki C. Washington. Per request of Mrs. Knox, there will be no planned memorial service.